The UKF Group have been providing a high-quality service to the UK and European Manufacturing Industries for over 25 years. The Group’s portfolio includes UKF Stainless, The Joint Perforating Company, Ferrari Stainless & Alloys, and Stainless Metals & Alloys. Through these brands, the UKF Group supplies and processes stainless steel and aluminium materials across the UK and Europe. Really easy to work with UKF/JPC, the whole team is dynamic, very nice and professional they make the difficult easy but never forgetting business. Congratulations! Having dealt with our sales contact at UKF Group I can say that it’s honestly a pleasure. I am kept informed on the progress of my works, as well as being supplied with realistic deadlines and not a lead time to draw you into a sale. We have requested some extremely tight schedules and we have been supported throughout our orders. Their pricing is what attracted us initially, the service we receive will keep us coming back. As a major supplier to the automotive market we have been sourcing materials from the UKF Group over a number of years, I can confirm that during this period of time we have enjoyed excellent service, quality and re-activity and as such I would therefore have no hesitation in recommending them to potential customers who require that “extra mile” in pursuing total supply satisfaction. The West Midlands based Stockholder was founded in 1992. Since starting out as a supplier of welded stainless steel tube operating from the Group Chairman’s spare bedroom, the company has expanded by leaps and bounds. Today, UKF Stainless operates as the main stockholder and distributor of stainless steel tube for the UKF Group. In recent years, the brand has expanded into providing value-added services, including laser cutting and polishing. The Joint Perforating Company (JPC) was founded in 2001 as the Group’s response to the growing demand for tube manipulation and perforation services. Over the last two decades, JPC has transformed from a small business with a tube perforating machine, into a pre-formed tube manipulating and perforating specialist. 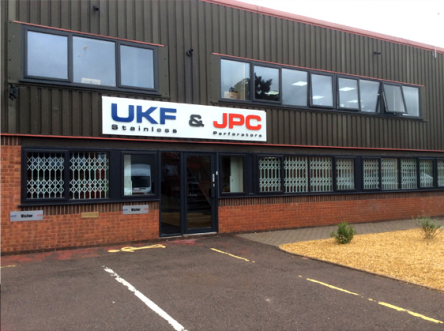 JPC currently operates from two West Midlands-based sites and works closely with businesses from the Automotive and Domestic Appliance industries. Ferrari Stainless & Alloys Ltd is a leading supplier of premium quality Stainless Steel and Aluminium products to the engineering, marine and civil projects markets. Ferrari Stainless’ inclusion into the UKF Group has provided the Bournemouth-based company with the security and freedom to expand, while broadening the Group’s product range. After identifying a gap in the Irish market, the UKF Group formed Stainless Metals & Alloys in 2015. Operating across both Northern Ireland and the Republic of Ireland, Stainless Metals provides Stainless Steel and Aluminium products to a variety of market sectors including: Engineering, Fabrication, Architectural, Tanker, Brewery, Dairy, Food, Beverage, Biogas, Water, Pharmaceutical, Automotive, Biotech and boiler industries. Stainless Metals is one of the fastest growing suppliers of Stainless Steel in Ireland, with warehouses in Lisburn and Dublin and a dedicated transport fleet.